How are your digital music genres organized? Are they general musical styles, like 'rock' or 'pop' or are they very specific, like 'ambient techno' or 'bubblegum pop'? Having a coarse grained genre classification for your MP3s can have advantages. What's a coarse grained classification? It means there are few genres, probably fewer than ten, with a lot of music assigned to each genre. The genres are likely to be general, like the 'rock' or 'pop' examples I gave earlier. We could call this the fundamental music genre list because the genres are the fundamental, elemental building blocks of musical genre, from which other, finer grained genres come. The key disadvantage is that music can vary within a genre, so the coarser grained the genre the more variabilty exists within the genre. This means playlists constructed from a genre can vary quite a bit. 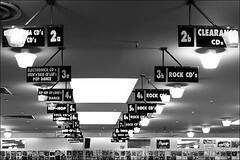 Genre is only a guide to styles of music. Genre is largely derived from musical period, the instruments used and techniques used to play them. Jazz and Classical are clearly enormous genres with huge variability within. I could break classical into romantic, baroque, ballet, neo-classical, minimalist... and so on. Still, we are aiming at brevity, so classical it is. As I compiled the list I realised that the right classification really depends on your own musical tastes and your existing library. If you have a library biased toward particular types of music, which most people probably do, it makes sense to expand the genres granularity of that genre. For instance, if you are a classical music fan with a few jazz records, retain the above list but expand classical into, as mentioned before, baroque, romantic, minimalist etc. So, maybe the conclusion is that the fundamental music genre list is a start point, from which you can expand the detail of genres as your music collection demands.